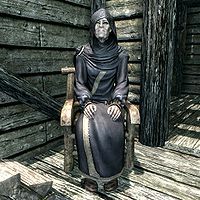 Anise is an elderly conjurer living in Anise's Cabin. She appears to be a lonely alchemist, with several ingredients, some uncommon, lying around her home. She wears blue mage robes and a pair of boots. 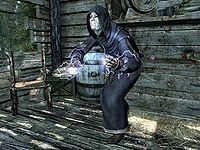 She carries a potion with a restore magicka effect as well as a dagger ranging in quality from steel to daedric. Anise will remain in the chair outside of her home until you visit her basement. If you enter her basement, she will be waiting in front of the exit to the cabin. Anise will pretend to be a kind, elderly woman if you attempt to speak to her before you learn her secret. Trying to converse with her will have her talk about how difficult life is for her on her own, how she appreciates your company, and how she isn't anyone of importance, "I'm just a poor old woman, dear. No need to trouble yourself with me." "It's so nice to have a visitor." "I get so lonely out here." "It's tough, just scraping by out here. But I make do." Near the bed inside the cabin is a small hatch to the basement. Inside is an arcane enchanter, an alchemy lab, and Anise's letter revealing that she is, in fact, a witch. After you exit the basement, Anise will attack, yelling "Fool! None may know my secret!" Anise will attack when you exit the basement, regardless of whether or not you enter or leave undetected. If she is killed, her body will remain in the game forever. Occasionally, if she is attacked by a wild animal while in combat with the player, she may not attack the animal, but instead perform the clapping animation. ? This page was last modified on 11 March 2017, at 20:21.